To say it as it is: I had 4-5 great days at the German Windros Festival during 5th to 9th of September making new friends, lots of rehearsing and some really fun concerts, with good musicians and composers that I met for the very first time. Accordion player Jesper Vinther (Phønix, Ostinat Ekspressen) and I had a couple nice concerts as people was sitting close together listening to the music and the songs (‘Roots Music aus Kjøbenhavn’), and to our stories and explanations. This was our very first concert together ever, even though we have known each other for many years, but Jesper is super professional, so this was ‘piece of cake’, so to speak. A mix of old songs and traditional dance tunes, spiced up with a few of my compositions – all in new arrangements. I always knew that the big challenge would be the work with the big Windros Festival Orchestra. There was a lot that we had to find time to teach each others, before we were supposed to do the main concert of the festival. 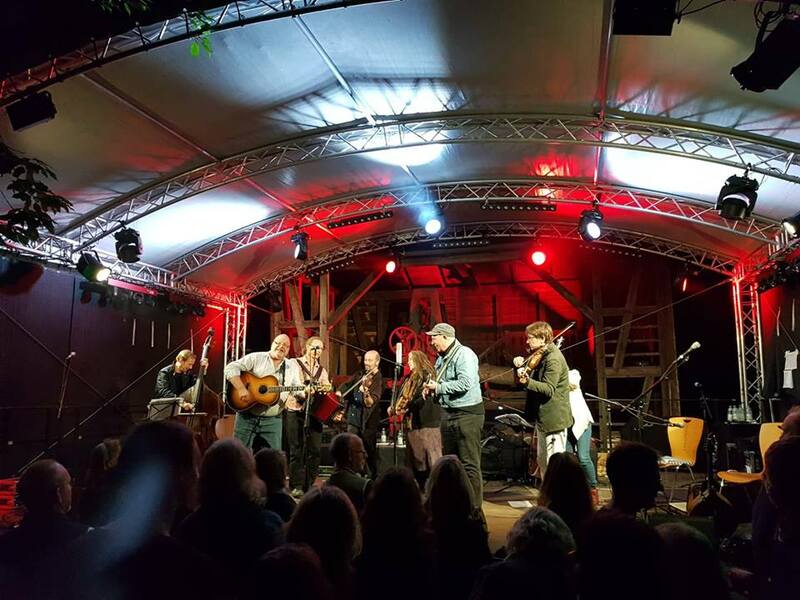 But 2-3 days of intensive work did result in an absolutely awesome concert on Saturday night 10pm to 11:20pm, a concert with lots of new music, lots of minor mistakes, and lots of happy, singing, laughing – but also sometimes very serious – people in the audience. 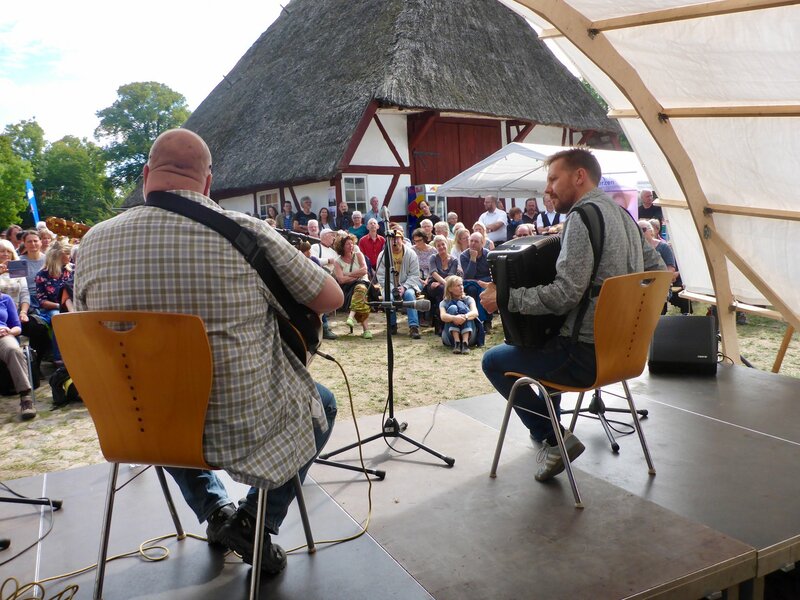 Jesper Vinther og jeg spiller vores anden koncert på Windros Festival. 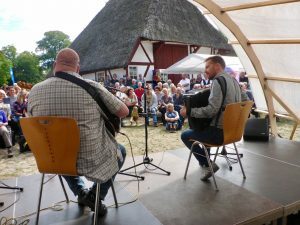 Det er søndag formiddag, og folk er troppet talstærkt op for at høre et sammensurium af de bands som har spillet de foregående dage, og som stadig er på festivalen på det tidspunkt. Ganske som de gør det på f.eks. Halkær Festival. It was good fun to be allowed to play on good German, English and Scottish coworkers music, but not the least fun when they played on my music, such as ‘Ingelas Waltz’, *The sorrow’, ‘Vindmills’ and a crazy and super simpel cajun tune that I heard many years ago somewhere on the American east coas, that we ended up using as a funny encore making everybody in the audience sing along. That was one of the highlights for me. The concert was recorded for German radio! If everything goes the way I hope, I’ll will be back in Windros next year with a friend and colleague, but more about that when all deals are done and settled. Here you will find a little facebook video clip from the day after the main concert where we, on the final concert of the festival, plays Gavin Marwick’s composition ‘Firedance’, a small suite with a nice melody and a good grove.